Aunty Merle, one of comedian Marc Lottering’s more famous alter egos, now boasts a whole musical to herself. It’s quite an achievement for Lottering to observe his beloved creation come to life, aided and abetted here by a full-blown cast which adds family and friends to his lively little narrative. Written by Lottering, who also co-wrote many of the songs with Tarryn Lamb, Aunty Merle The Musical is a fun outing. It brings the outrageous character from Belgravia Road, Athlone, who loves to share her opinions over a slice of home-baked lemon meringue, into perspective. We get to know about her, her husband Dennis (Royston Stoffels), her daughter Abigail (Tracey-Lee Oliver) and her son, Carl (Anzio September). There are a number of other entities who float into her orbit, including her loyal helper Lydia Majola (Tankiso Mamabolo) and her nosy neighbour, Soraya Samsodian (Carmen Maarman). Developed from his one-man stand-up comedy routine, Aunty Merle has a following of her own and it is to these people that Lottering is catering. The sheer delight of watching a Joburg audience react to Aunty Merle’s acidic humour and antics emphasises the impact this character has. The script is peppered with political references and day-to-day incidents and the story follows a predictable path; a woman from the Coloured community falls in love with a white man from the wealthy suburb of Bantry Bay. Can it work? Gina Shmukler plays Alan’s “kugel”-type mother, full of her own importance, and Adrian Galley is the father, just one of several roles he plays. The fly in the ointment is Abigail’s ex-boyfriend the slimy Denver Paulse (Loukmaan Adams), who returns to Cape Town from Joburg to try and prevent the wedding from taking place. He harbours a dark secret about Abigail’s past which he will reveal. Sizwesandile Mnisi plays Siya Dlamini, Carl’s best friend from varsity. There is also Zandile Madliwa as Lydia’s feisty daughter Nambitha who returns from studying overseas, and rams in a few home truths. As a musical, Lara Foot’s production has its rough edges and, from time to time, one gets the impression that it’s more of a concert with a theme, where selected individuals get to sing their party piece. There is nothing wrong with this, but the method tends to hinder flow and cohesion. The singers are excellent. There are stand-out performances from Tracey-Lee Oliver’s Abigail who has fallen in love with Alan White (Paul du Toit), and the singing Home Help, Tankiso Mamabola whose number, Someone Else, is a heart-wrenching experience. The tuneful numbers encapsulate the mood and vary from the opening segment, I Believe in Love, performed in a bar by the besotted young couple, to Thank God They’re Getting Married, which says it all. There are more than a dozen freshly brewed songs and they fit snugly within the show’s content. The acting is sound throughout, but Marc’s Lottering’s hilarious Aunty Merle steals the show with her rapid flow of dialogue – sometimes difficult to hear – her change of costumes and her understanding of young love. 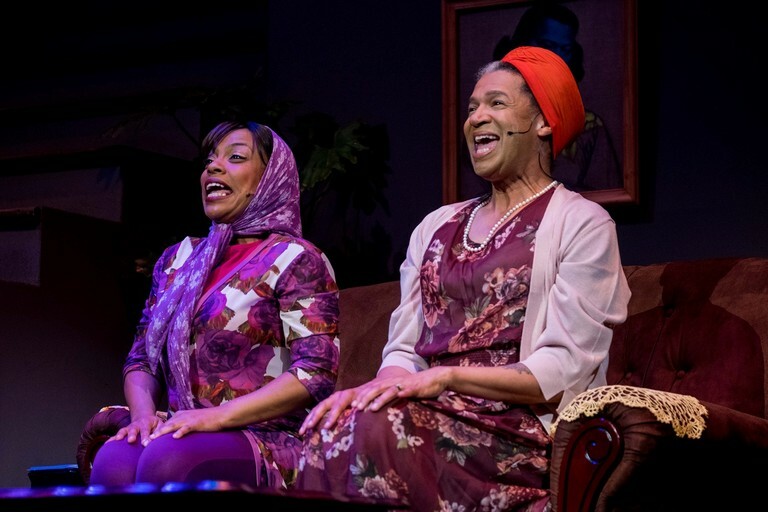 With 14 actors, dancers and a lively seven-piece band on stage, Aunty Merle The Musical is bright and breezy and will lift the spirit no end.